The Air India memorial was installed in Stanley Park on July 27, 2007, twenty-two years after the disaster. I was vaguely aware that the installation had occurred. You scan a newspaper article or catch a few words on the local radio news and mentally auto-file some skeleton version of the information, so it was not entirely a surprise to come upon it on our Saturday morning walk. 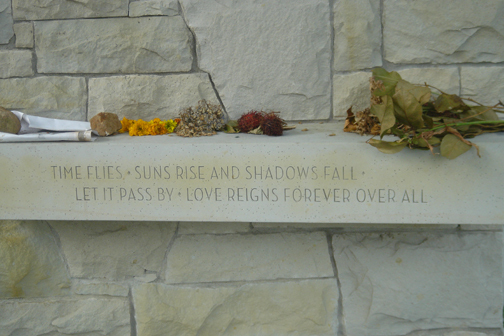 on the front of the arc are the same words found on the sundial in the Toronto memorial and the Ahakista memorial in Ireland. The words are said to have come from a Latin inscription found by the sculptor who created the Ahakista memorial. It’s moving and beautiful and the weight of names makes you angry that so many people died and the investigation was mishandled in such a way that the perpetrators were never even brought to our watered-down version of justice. Kim Bolan’s book Loss of Faith details the painfully slow and problem-ridden process. After the initial emotional reaction, I found myself wondering about the whole process of designing and creating the memorial. Maybe this is just another example of how humans manage and compartmentalize the unthinkable: we turn to practical aspects. We start planning a funeral service and concentrate on the details; we draw up lists; we create a website; we become advocates for a cause. We think about design and how to create something generally acceptable but not trite. We select materials and think about the logistics of layout. How would you choose the typeface: one that would be simple and classic and legible and would make best use of space? Fitting all of the names neatly into the area available must take careful calculation. The site must be dignified but also appealing and accessible, so that visitors to the park are drawn to it. It is next to a children’s playground that is intentionally an integral part of the site, as many children died in the tragedy. I think it would be a challenging assignment, but one that would create a sense of accomplishment. You would be performing a service to the victims and the bereaved families by using your talents to create something permanent that stands to remind us of past wrongs. Not many of us have such meaningful work. The memorial was created by Lees & Associates, landscape architects. This entry was posted in Canada, Typography by anmaru. Bookmark the permalink. c. If it has a genuine vintage, it would be from the 1920’s to the 1930’s, possible Art Deco period/style. It has a kind of e. Agatha Christie or Hercule Poirot feel to it. d. Note the overall condensed proportions, yet the D looks like it’s based on the O, likewise the E is based on the L, the P the B, the N the H, and even the M is squished. This all means that it has a rational approach to its design, that stems from typefaces like Futura (1927) in which the 26 letters of the alphabet were broken down into groups with ‘like’ features and given a similar geometry. e. The reason why it’s not a pure sans serif is because of certain features: for example the cross-bar of the A, E, F and H and the large upper ‘bowl’ on the R and P are all BELOW the half way level. Usually these features are either above the optical half way level, or in the case of the P and R not as extreme as this. f. Lastly the S is distinctly decorative, with the upper curve significantly different from the lower portion. Looks like a swan. I forgot to mention the thinness of the strokes too; almost hairlines rather than, say, 1/12 of the height. This typeface flaunts rationalism when it feels like it but then abandons it for more character when the going gets too stern. Hi Anmaru, I was the lead designer of the memorial and I really appreciate your comments. It was an incredibly meaningful project to be a part of. I feel honoured to have had the opportunity to work with the families of the victims. I really like your image of the wall and would like to have it in our archive. Could you tell me where I could get a higher resolution version of the image? Leila, I’m so pleased to hear from you and I congratulate you again on your design. I will certainly send you a higher res image.